Kiefer Sutherland as Jack Bauer, the world's unluckiest counter-terrorism agent, is so 2001. 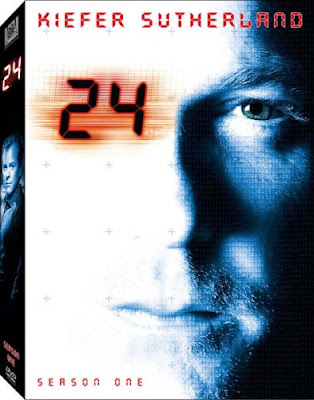 Season 8 of Fox's "24" begins tonight, and I must confess that I gave up on this series years ago. In 2001, when it was new to the airwaves, the premise of a program in real time was novel and gripping. Sure, even then, the show had its problems (Jack's wife's amnesia, Kim Bauer), but they were easily forgiven in the show's infancy. To boot, nine years ago, the show featured the lovely Sarah Clarke as the twisted and evil Nina Myers, who would be killed by Jack Bauer two seasons later. But that was then. These days, the show rigidly adheres to its tired narrative playbook, endlessly recycling its plots and themes and attempting to shock its viewers at the end of each episode. But to what end? We've seen it all before; there's nothing new here. Yawn. What the show's producers have done to try to shake things up for the new season is not encouraging. The setting moves to New York City (but it will mostly be shot in Canada), and although that sounds more promising due to the compactness and immediacy of that city, I suspect a new locale cannot save the show from its inevitable doldrums. Further, Katee Sackoff from "Battlestar Galactica" joins the cast this season, but not even that casting decision could compel me to set my DVR to record this mess of a series. Would that the writers and producers would do something truly daring with the show, but alas, from what I gather, viewers are still left with moles and traitors and backroom presidential politics, all of which have been done to death and to death and to death. (What might have been? In 2005, the pop novel writer Dan Brown rejected the offer of 24's producers to adapt The Da Vinci Code into a full season of "24." Whatever that book's merits, that would have been an interesting season.). Alas. So, to you, "24," I say goodbye.